Great card Anita and this buggie is so sweet! Love the dp you used. Love your Bugg card--the hedgie is too cute! OH SO SWEET! Beautiful card! LOVE the colors and shading! 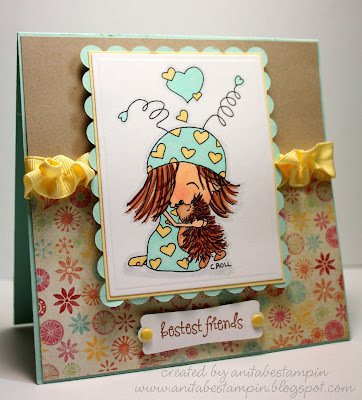 Anita, what an adorable card and love the papers, and that twisted yellow ribbon. I really love the way the image stands above the card. Great job. Very cute! I love that dp and the scrunchy ribbon! this buggy girl is a popular one today, she's so sweet! beautifully colored hun!! This is so adorable. Love how you colored it. It really pops! Thanks for sharing. CUTE CUTE CUTE!! I really love how you have done that ribbon. Such a perfect card!!! Really pretty; great color combo along with the Kraft and love that ruffled ribbon! What a gorgeous card! Love your colouring and the shading! what a great card I love it! You coordinated the colors so well, Anita, and how did you curl that ribbon? Great image and very cute coloring. tooo cute!! love your layout and your DP is gorgeous! aaaah such an adorable card. Wowie super cute and bright! Thank you for being part of our hop! Love the card! Love the colouring you have done! This card is adorable and I love that paper and ribbon! so cute Anita.... love that bug and her hedgehog!!! Great card!!! She's so sweet!!! This is simply gorgeous, Anita! Love it!! ah these stamps are sooooooo cute loveing the cards. This is soo cute! I love the sentiment- it goes PERFECT with the image! So adorable Anita! I'm with ya, this has to be one of my favorite images too! You did a fantastic job on it as well! This is such a sweet card and I love how you did the ribbon. sooooooooooooo pretty and GREAT photograph of the card!! you did an amazing job!!! Anita - head over to my truffle post...you won; need your info. I love the paper you chose for the background on this card. Great Job!